Origin of the “Z” logo. Many Ask the origin and meaning of the trademarked “Z” logo used by Outer Zone Overnight (TM). When this organization was being conceived, the founders wanted something that would have a strong impact and combine many elements, yet have simplicity and still remain open to interpretation. Components within the actual graphic are the letters “O” and “Z”, as well as a cross, which is the universal symbol for aide. The “O “and “Z” are meant to imply “The Outer Zone”, which for this organization, is a generalized reference to anywhere outside the known boundaries of cities and towns, and outside of the traditional comforts we have all come to enjoy. We seek to explore the areas outside these boundaries. The image and logo is purposely distressed, as it is intended to look as though it has withstood the trials of time, which is the intent of the organization. This also gives the illusion that the overall logo is some sort of vault lock door, and that it is secure… concealing treasures and secrets….In some ways, we are, mainly by the exploration and charting of odd, forgotten, and overlooked locations which is a primary activity within the organization. Another intent of the image we seek to portray and ideal we aspire to maintain: Safety and security. Hidden behind the “Z” is the cross and within the inner circle, some may argue is the Earth. Honestly, this is accidental in the imagery due to the distressing of the image, however it works symbolically as the ideals held by organization members pertain to dealing with the world in distressed state. “Z”, being the last letter of the alphabet, is synonymous with “Omega”, or the last. All members of Outer Zone Overnight (TM) may be considered by some definitions “Omega Men and Women”, as they seek to be the survivors, or the last standing, when the world has fallen to decay through natural or man-made events. Elements of the logo were also inspired from early illustrations of L. Frank Baum’s “The Wizard of Oz” where the gates to the Emerald City bore a seal and crest, which was adapted in original artwork for this organization. 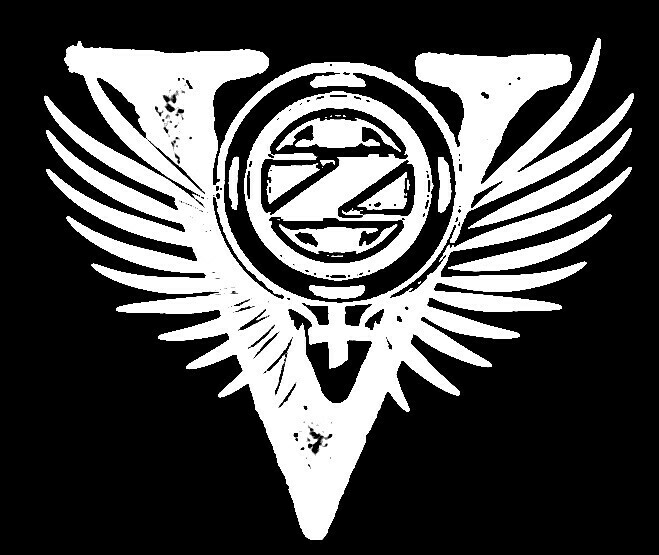 The “V” logo is used by Outer Zone’s members in support of the “V-Core“. V-Core is the contingent of O.Z. members who are female. Unlike many other organizations with similar objectives, O.Z.O. maintains a very high and active ratio of female members. The “V” stands for “Valkyrie”, as the nickname given to all female members of the O.Z. In Norse mythology, a Valkyrie (from Old Norse valkyrja “chooser of the slain”) is one of a host of female figures who decide which soldiers die in battle and which live. As the female members of the organization have time and time again proven to be a driving force in the organization (planning, organizing, researching, conducting continual education and betterment of selves and other members, exploring, charting, mapping, building skills) they have earned the name. Two of three senior officers in the organization are women, with several more running support for the day-to-day operations of the organization. Outer Zone Overnight(TM) believes in the empowerment of all members, and works exceptionally hard to insure that all within the organization have opportunity to grow and enhance the elements of leadership within themselves. The logo was designed by the V-Core group, with the intent of the imagery to depict wings of a Valkyrie and the ability to embrace new heights. A “V” to represent the namesake and to represent “Victory”, and the extension of another cross to form the female symbol of fertility.